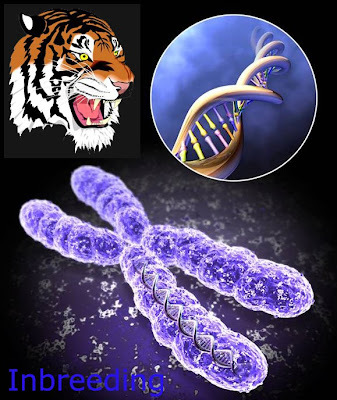 INBREEDING DEPRESSION AND SARISKA TIGER RESERVE. .. This panel consisted of a WII expert, a NTCA representative and Chief wildlife warden (CWLW) of Rajasthan along with Mr. Jogi. The room had a long table with the 4 experts sitting on one side, the NDTV reporter sitting on a side desk and a group of audience sitting in stalls in the front where I too sat as a spectator. ‘Oh yes! 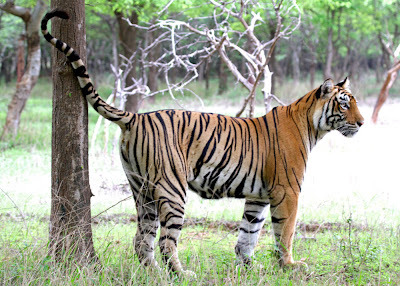 Recently 2 tigresses were shifted from Ranthambhore to Sariska both were from the same mother and the same father. Mother Machali II and father Male X. A little about Machali - Machali is a beautiful tigress she was named so because of the 'fish' like marking on her face. The real Machali suddenly vanished one day and from that day onwards a group of film makers filming her started calling a tigress Machali, we call her Machali II here. Machali II is an equally beautiful tigress. But this tigress doesn't posses the fish-like markings. Machali II is about 13 - 14 year old today. The above are her litter's. Machali II is the most photographed and filmed tigress possibly in history! As per TOFT(www.toftigers.org/ ) she is the most revenue earning tigress forRanthambhore National Park! More than economical significance her ecological significance is far greater, due to her two offspring’s Sariska is alive again! Machali has given birth to 9 tigers till date. Out of 9, three died. Of the 6 living today 2 tigresses are shifted to Sariska and 4 are in Ranthambhore. Inbreeding depression is thought to be a result of harmful pattern of inherited genes. Inbreeding depression is thought to be caused primarily by the collection of a multitude of harmful mutations, few in themselves fatal, but all diminishing fitness. Normally, in an outbreeding population these alleles would be selected against, hidden, or corrected by the presence of good alleles (versions of genes) in the population. Sexual reproduction and the shuffling of alleles of genes occur when two unrelated individuals mate. 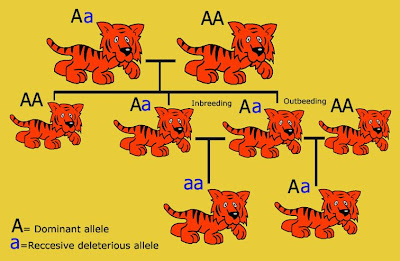 When that shuffling can't happen because both parents already have mostly the same alleles, the result will be inbreeding depression, if not in a given litter, then in a few more generations of such breeding. Genes associated with inbreeding depression could be grouped into three broad categories of function: those involved in metabolism, stress, and defense. o Increased congenital defects such as cryptorchidism, heart defects, and cleft palates. o Fluctuating asymmetry (such as crooked faces, or uneven eye placement and size). o Loss of immune system function. Now the CWLW didn’t know where to look! After all the tigers being wiped out from Sariska Tiger Reserve (Read more http://sariskastory.blogspot.com/) Rajasthan Forest Department shifted three tigers from Ranthambhore National Park to Sariska Tiger Reserve. A young male tiger T10 and female tigresses T1 aka Babli and T18. The two females were from the same mother Machali II with father Male X and possibly T10 also had the same father. Some guards from Dhundarmal ka Darra and Ananthpura reported that that Male X resided in the territory of T10's mother. 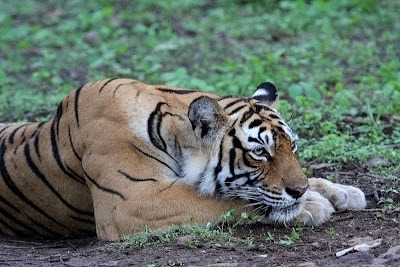 2 major population decline reports have been reported in Ranthambhore in the past 15 years. The latest population decline happened between 2002 and 2005. In 2005, ultimately just two males had survived Male X and Jhumroo. 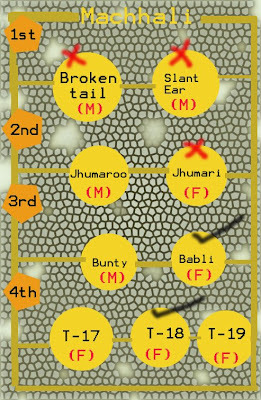 Jhumroo is son of tigress Machali II and male X is father of Babli and T18 and possibly of the T10 male as well because T10 shared the same territory as male X. Male X has been filmed along with Bunti and Babli and T17, T18 and T19, only a father of cubs would do this act and not any outside male. Jogi replied, ‘Sahib you have proved many times how authentic and learned you are. Your tiger relocation plan loopholes are out here. You have sent siblings to Sariska. Please also be reminded of the letter sent to you by NTCA Ref: No. PS- MS (NTCA)/2008– Miscle. Dated 3rd November 2008. Which said, ‘Under no circumstances tigresses residing within the RanthambhoreNational Park area should be translocated to Sariska, since this is bound to disturb the existing land tenure/ sociology of resident tigers. 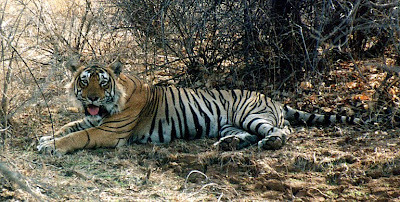 However, there may be no risk in translocating non-encumbered tigresses dispersing to prey deficient areas of keladevi or Mansingh sanctuaries, as established by field observations. Followed by this letter on the 4th November 2008 again a letter was addressed to you by the NTCA, Letter Ref: No. PS- MS (NTCA)/ 2008 – Miscle. which said, Further to the correspondence cited above, please ensure that no chemical immobilization of tigers for translocating to Sariska, should be done within the boundary of RNP. The officers and field staff may please be directed for strictly adhering to this advisory. In year 1999, Wikramanayake E. D et al. created a framework for identifying the High-priority areas for the conservation of tigers in the wild in the future. Tiger Conservation Unit (TCU) is an ecology based method for defining priorities for tiger conservation. It is to facilitate the best use of limited conservation resources. Based on several parameters they formulated the TCU levels I, II and III. Some of them are: Tiger habitat size, Habitat degradation degree, Fragmentation, Connectivity to other tiger habitat, Poaching, and Tiger population status. TCU level I receiving the maximum priority and III with minimum priority. 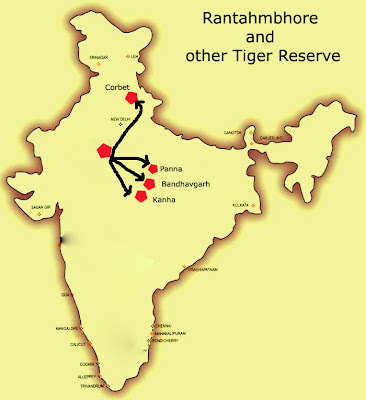 Ranthambhore is Level III Tiger Conservation Unit (TCU), The nearest tiger reserves are Corbett, Kanha, Bandhavgarh and Panna all of which are about 700- 800 km away from Ranthambhore. Hence new genes arrival chances are very bleak. NDTV spokesman asked if this is TCU level III conservation unit...then should the conservation work be stopped over here? If there are no chances of tigers surviving here. Jogi said, ‘Beta, this TCU research in terms of ecological factors is correct but in tiger conservation many other factors play a role.In a nation like India, politics is the major factor. One example is Simlipal, which is put as level I tiger conservation unit but that is in hands of naxalites and the local tribal’s have activities like 'Akhand shikar'.. .
Ecologically significant area: If there is Siberian tiger living in minus 45° Celsius there is Royal Bengal tiger living in Ranthambhore’s 45° Celsius. Similarly, on one end if there is Naam Dapha which is a rain forest on other end there is Ranthambhore like dry deciduous forest where the tiger survives. Tiger is getting wiped out from the dry regions of India but it still exists in dry region of Ranthambhore. It may be ecologically difficult to save but it sure is an ecologically significant tiger habitat. Tiger and tiger behavior monitoring: Tourists come here to see tigers but they get much more in their visits, an opportunity to see tiger behavior like mating, hunting, cubs raising, and relationship with other tigers, territorial fights. All because this is a dry deciduous open forest. In other areas tiger are elusive creatures and difficult to spot forget observing their behavioral patterns. Ranthambhore has limited water sources and since no animal can live without water and so the tiger, we do see it near water holes. Also, due to dry sand on the road pug marks can be spotted easily for tracking it. Tourists definitely have taken advantage of this and so the tourism industry has benefited and yes, few writers and film makers too. But the trained scientist who could have used this opportunity for understanding tiger’s undisclosed behavior did not use this it to the optimum level. Important for other cat species: Tiger is found in other places but species like caracal is found in very few places and Ranthambhore is one of them. Ranthambhore is an important habitat for the caracal, rusty spotted cat is also found here. Ranthambhore as a Conservation Temple: Many models of conservation were kicked off from here and many till date are working. Several other parks have adopted the models used in Ranthambhore. Many well known scientist and tiger experts have got the learning’s from Ranthambhore. Ranthambhore tigers are the most photographed and filmed tigers, interest in the big cat among the common man is due to these photographs and films of tigers. Hearing all this all were in a stunned state of enlightment, the NDTV journalist took over and said, ‘We shall end this discussion here today, but we do have a lot to go back and think! Congratulation for nice article on Ranthambhore & Tigers. Happens with humans also. And they have sent siblings to Sariska. Ranthambhore is a great place to see tigers and other species in the wild. They need more than 200 litters of water to drink per day. 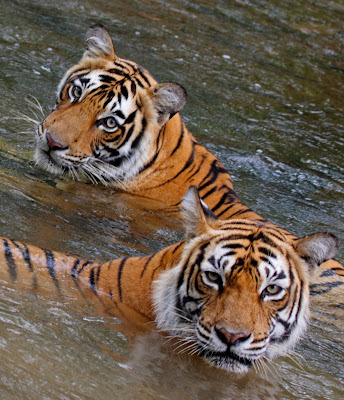 If they can survive then our Ranthambhore Tigers also live.